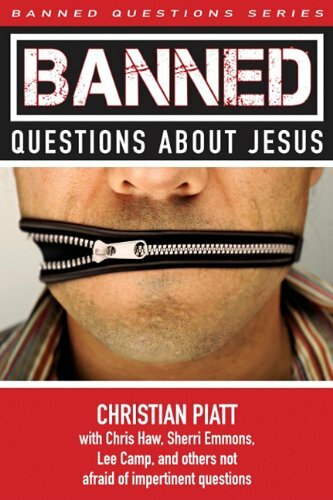 Christian Piatt, author of Banned Questions about Jesus & Banned Questions about the Bible stops by for a chat about church, Jesus, faith, the Bible and the important stuff in life. As a minister’s husband Christian has been part of planting a progressive Disciples of Christ church in Colorado. He Tweets, he blogs, and facebooks. Most important of all Christian put together a killer collection of thinkers, writers, and ministers to answer a some dangerous and banned questions about Jesus…the kind of questions in which the asking and the answering can be costly. Each author had just a few paragraphs to answer the question and they did so right next to others so the reader can compare, contrast, yell, and go ‘hmm.’ Not only was Christian wise enough to ask Tripp about Jesus’ sexual fantasias but he also brought some ‘A’ game to the podcast. Hope you enjoy the conversation! Don’t forget to sign-up for the Emergent Village Theological Conversation coming up in sunny SoCal Jan 31-Feb 2. Remember to put ‘Deacon Wine Tour’ in the referral box if you want to join the fun. If you already signed up and want to come just email me.